THE HAGUE (JTA) — A Belgian student association voted in favor of an academic boycott of Israel. 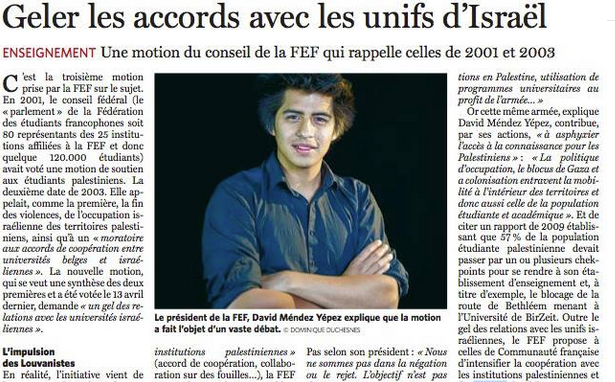 In a vote last month, the general council of the Federation of French-speaking Students in Belgium, or FEF, adopted a motion calling for “a freezing of relations with Israeli universities,” the Belgian newspaper Le Soir reported Wednesday. The motion was supported by 85 percent of voters. In an interview published Friday, FEF President David Mendez Yepez told Le Soir that his organization had kept the April 13 vote secret until now “to address people who would have been shocked or startled by our position.” Some 500 delegates voted, he said. “Isolating one party and preventing people from getting to know the other constitutes discrimination which runs contrary to the ethical, moral and educational role of the university,” he told the European Jewish Press.